Just to see how it works, I joined up two of the big old blocks with the sashing. 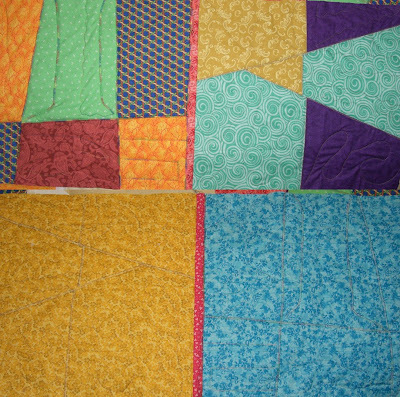 Since this is a somewhat scrappy quilt anyway, I am going to use strips that I have trimmed off of various projects to use as the sashing; although I may cut some larger pieces and have repeated fabrics in the joining too. I haven't really discussed the BACKS of the blocks. I am using FQs trimmed to size (which tends to leave me a sashing strip!) for the backs. I think the back of this quilt will be as fun to look at as the front. The first picture show both the front AND the back of the two joined blocks. What you see between the two is just what was under it when I took the picture. I was lazy and didn't edit that out. 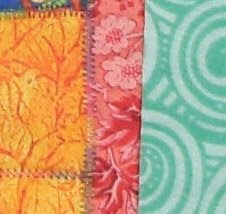 I love the bright blue and yellow "squares" with the pink (although it looks red in this picture) strip between them. This smaller picture is just to show a little detail of the join. I opted to not do a deco stitch over the finished seam and to only do it on the one where it actually fastens down the sashing. In the book she used many different decorative stitches to do attach this seam. I just used the zigzag for this one. I am planning to do them with several different deco stitches. But, I love the zigzag with this multicolored thread. I also have some bright aqua thread and some red that will be used for some of the other seams. I think I could have just done a straight stitch and it would have worked perfectly. But the deco stitching adds some pizazz to the quilt. I like a little eye candy. This is going to be a very fun quilt to make. Plus when I get it all joined there is just the binding to sew on and it is ready to use. How awesome is that? Thanks for showing the detail on this. I took a day-long class at last year's MidAtlantic Quilt Festival with Carol Blevins and it was a Quilt As You Go class....lots of fun and she had even queen-sized quilts she showed that she has done with her technique. Great job you are doing with this. Glad I hopped onto your blog. I love checking out work done by men. Thanks for sharing your work. PLEASE TEACH ME HOW to do this!!! I LOVE IT.. Very nice job but of course everything you do is a awesome. You are to smart.. I'd like to get an instructional on this also, Gene. Your last one was very good. I like what you are doing. And the quilting part would be so nice to do as you go and much more convenient for us without a long arm. I like this quilt. It looks fun and shows of the quilting. I might have to try one of these some day, but right now I have to many irons in the fire.